Three families have been left homeless after a large fire spread through several houses on the outskirts of Belfast, causing a oil tank explosion. It is believed the blaze started in a garden shed in Sunnyhill Park, Dunmurry at 03:50 BST and spread to surrounding homes. It gutted three homes, causing two roofs to collapse, but no-one was hurt. The families whose houses have been destroyed include a married couple who had just returned from honeymoon. At the height of the blaze, 60 firefighters and eight fire appliances were involved in bringing the oil-fuelled blaze under control. About 3,000 litres of home heating oil caught fire as the flames spread to four oil tanks. Twelve homes had to be evacuated during the early hours of the morning. Local resident John McGill told the BBC he was woken by "sounds like explosions". "I looked out the window and the night sky was lit up, literally," he added. "We were very worried then, it was like an inferno." Mr McGill and his neighbours left their houses and waited for fire crews to arrive. "I think they were gobsmacked at the extent of the fire," he said. 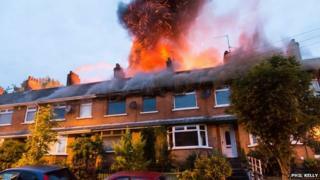 Northern Ireland Fire and Rescue Service (NIFRS) area commander Kevin O'Neill described it as "quite a complex fire". "We were called initially to a shed on fire," he said. "The shed fire spread to a fence and then to an oil tank which ruptured. "The oil from that oil tank flowed across the back of several properties, setting fire to other oil tanks, causing partial roof collapse on two properties," the fire officer said.